The Congressional Budget Office released yesterday its regular annual report on the long-term budget outlook for the federal government. Surprisingly, it did not receive much attention in the press (at least not yet). But the implications of the projections it has made are important: They basically indicate that were it not for the Bush Tax Cuts passed in 2001 and 2003, we would not be facing a long-term fiscal problem. That is, if tax rates were allowed to return to those we had during the Clinton years, along with some near term control on spending, federal government debt as a share of GDP would stabilize and then fall. And since the economy prospered during the Clinton years, there is no support for the argument that such tax rates would stifle long run growth. The results are consistent with projections made in a posting on this blog on February 11, 2012. In that blog, results are shown from calculations (based on underlying CBO numbers) which demonstrated that phasing out the Bush Tax Cuts would lead the federal government debt to GDP ratio to start to fall. The new CBO numbers, with calculations by their staff rather than myself, back this up. The figure above shows the CBO projections of federal debt (held by the public) as a share of GDP, for the period FY2000 to FY2037, under two scenarios. Under CBO’s Baseline Scenario, current law is followed in all respects. This includes that the Bush Tax Cuts would be allowed to expire (as currently provided by law) at the end of 2012, and that the budget cuts mandated by the 2011 Budget Control Act for the period 2013 to 2022 (if Congress failed to make similar cuts before then) would be implemented. Medical payments to doctors made by Medicare would also be cut (as per a law passed by the then Republican Congress in 1997, but then over-ridden annually since then), while over the longer term, the growth in medical costs would be moderated through the implementation of measures passed in the “ObamaCare” reforms. 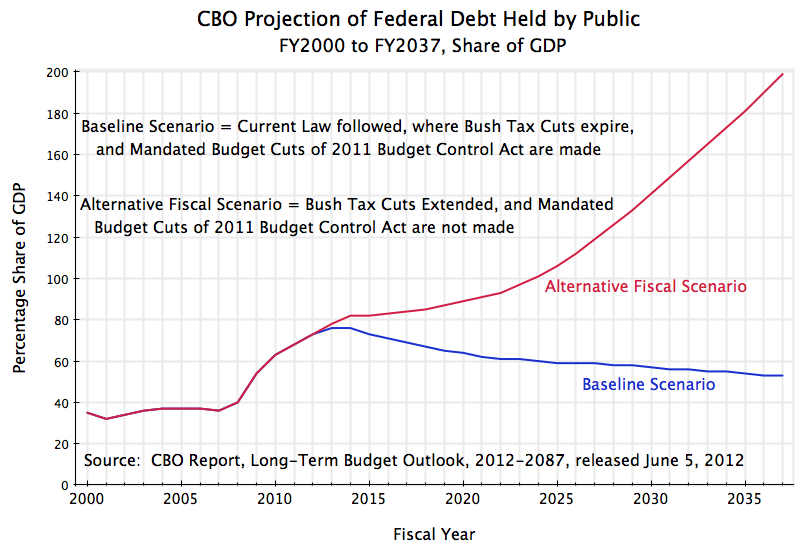 Under the Alternative Fiscal Scenario, the Bush Tax Cuts would all be extended permanently, the 2013 to 2022 mandated budget cuts would not be made, after 2022 budget expenditures would be raised further to historical levels (as a share of GDP), medical payments to doctors would not be cut but rather kept at current levels, and the ObamaCare medical cost reforms would not be implemented, so medical costs would rise compared to the costs in the Baseline Scenario. The CBO also mechanically extrapolated the underlying numbers under the two scenarios all the way to 2087, but wisely focussed on the period to 2037 (the next twenty-five years). The longer term numbers are subject to much uncertainty. The diagram above presents the CBO numbers to 2037. What is striking is that the figure above shows that under the Baseline Scenario, where current law is followed and in particular the Bush Tax Cuts are allowed to expire, the federal government debt to GDP ratio peaks in 2013 and then immediately starts to fall. Indeed, the long-term numbers extended mechanically to 2085 indicate that the federal government debt would fall to zero in 2069. In contrast, the debt to GDP ratio grows explosively upwards under the Alternative Fiscal Scenario. It was noted above that a number of changes are made in the Alternative Fiscal Scenario compared to the Baseline Scenario, affecting both tax revenues and spending. However, one can calculate from the underlying data released by the CBO along with its report (in spreadsheet form at the CBO site), that 76% of the higher deficits in the Alternative Scenario over the key period 2013 to 2022 would be due to the lower revenues following from the Bush Tax Cuts. Higher government spending other than on medical expenditures accounted for 18% of the higher deficits, while higher spending on medical costs (principally for doctors over this period) accounted for only 6% of the higher deficits. That is, lower revenues due to the Bush Tax Cuts account for three-quarters of the difference in the deficits between what one would have under the Baseline Scenario and what one would have under the Alternative Fiscal Scenario. Given the extent of the decline in the debt to GDP ratio that one sees under the Baseline Scenario, it is likely that allowing the Bush Tax Cuts to expire would alone suffice to lead that ratio to start to fall in these new CBO scenarios. My February 11 posting on this blog did find this. But it should be noted that the new CBO scenarios included other factors as well in its projections, which accounted for one-quarter of the reduction in deficits. The report does not show a scenario focused exclusively on the impact of the Tax Cuts. It should be emphasized that no one, and certainly not myself, is arguing that the Baseline Scenario should be followed in all respects. Doctor payments under Medicare should certainly not be allowed to be cut sharply as they would if the annual “Medicare doc fix” were not extended. Nor, I would strongly stress, should all the crude and across-the-board spending cuts mandated by the 2011 Budget Control Act be allowed to go through. The basic point, rather, is that drastic cuts in entitlement programs such as Social Security and Medicare are not absolutely necessary for the US to achieve budget balance, despite what Mitt Romney, Congressman Paul Ryan, and other Republicans have asserted. What the CBO scenarios show is that the Bush Tax Cuts have led to the US fiscal debt problem, and that simply allowing these Tax Cuts to expire would likely suffice to fix that problem. The US debt spirals out of control due to the Bush Tax Cuts. To fix a problem, it is important to know the source. The CBO scenarios make clear that the primary source of the exploding federal government debt is the Bush Tax Cuts. And while I would not advocate an immediate re-instatement of tax rates to their previous levels, since the economy remains weak, phasing out the Bush Tax Cuts over the next few years would suffice to resolve the fiscal problems we face. This entry was posted in Fiscal Issues and tagged fiscal deficit, government spending, tax system, taxes by aneconomicsense. Bookmark the permalink.